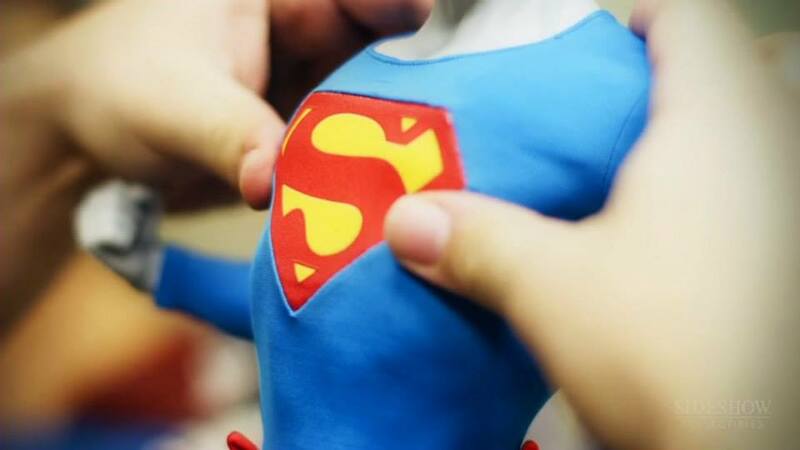 Fleetingly teased during their Into The Halls Of Justice promo as far back as Jan 2012, Sideshow Collectibles have finally affirmed their commitment to the classic Superman Movies by revealing their prototype PF (Premium Format) figure. As the initial pics (taken from the latest Production Peek) above show, the figure is at prototype stage (featuring fabric costume and Christopher Reeve likeness) but awaiting a finished base (full reveal expected soon). Typically, when it comes to translations of the original Caped Wonder to 3D, fan opinion is immediately polarized. Though highly anticipated (especially its official debut in ¼ scale!) it seems the initial excitement has been dampened by concerns regarding the statue’s unnatural pose. Further issues with the (otherwise admirable) likeness such as an overly tall forehead and odd drooping brows one would hope could be easily rectified before production, but this is by no means guaranteed. Longtime followers of SUPERMANIA may know this a road well-travelled when it comes to campaigning for the best Reeve Superman figure possible for your hard-earned cash. 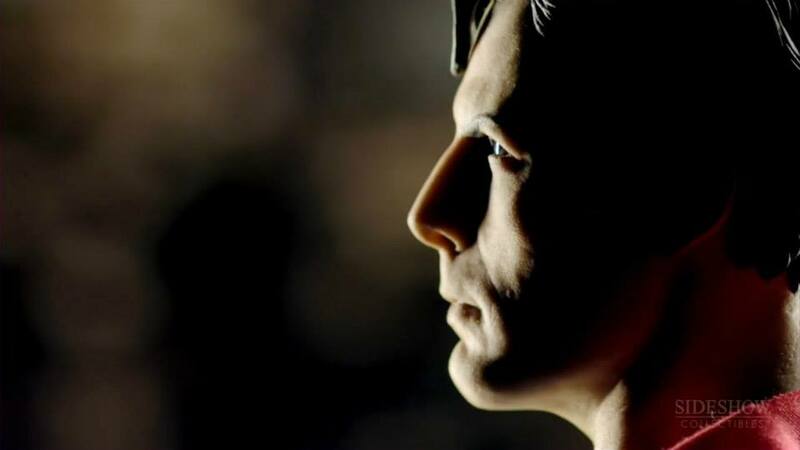 Though most are failed endeavours (see: Hot Toys costume) occasionally the passion (or vitriol) of fans reaches the companies concerned in time to make vital adjustments (see: Hot Toys sculpt) initiated here purely for the benefit of collectors rather than any declaration of superiority. That said, what is becoming inexplicably more apparent with each subsequent release of new Reeve Superman merchandise is an abandonment/ignorance of the source material. One could happily tap-dance on the entire shipment of Superman Cinemaquette’s for starting the godawful trend of sculpting figures in mid-descent. Indeed, this ridiculous emulation of ‘Riverdance’ with requisite flounce is made all the worse by the fact it was NEVER seen on screen and in all likelihood would not appear as such if it did. So it is with considerable resignation that, bestowed with a character who strikes an iconic pose in most every scene he appears we have been gifted, baffllingly, with yet another contorted non-canon interpretation. 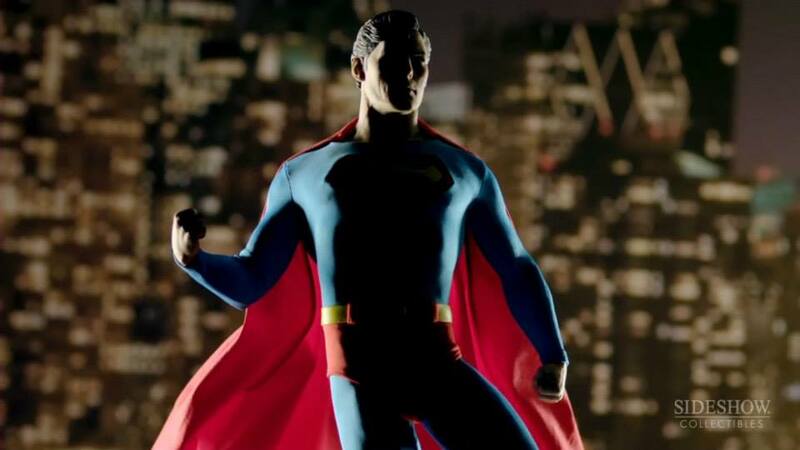 This is made all the more frustrating by the fact this disproportionate body is adorned by far and away the most lovingly-tailored (and screen-accurate, short of the belt being a ¼ too narrow) costume seen on a Superman Movie figure to date. Complete with a base (again, given a multitude of screen environments to choose from) apparently modelled after the bursting Hoover Dam?!? – and you are left with a puzzling concoction. With Sideshow’s rich history of producing outstanding PF’s you could be forgiven for expecting the creative team to understand the impact of letting a character ‘speak’ for itself in an elegant, relaxed pose vs. overworked. One glance at the masterpiece that is their ‘Raiders’ Indiana Jones PF affirms this. 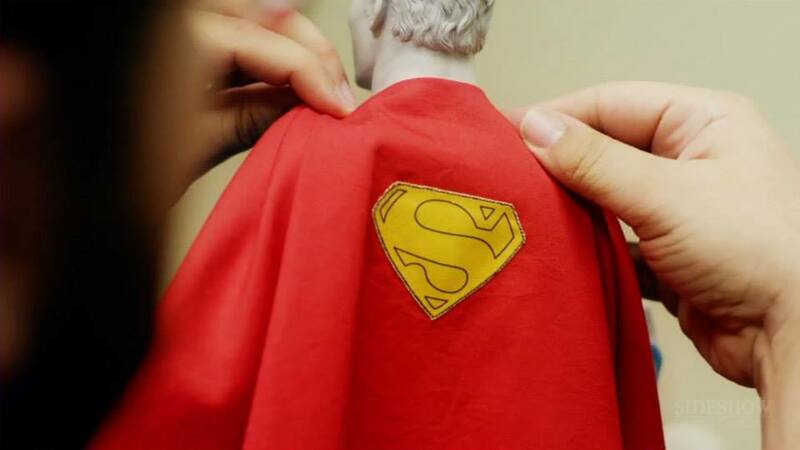 If this prototype is indeed intended as the final version I fear a great opportunity to repeat that success and produce the definitive Superman statue will be lost. We shall see..!